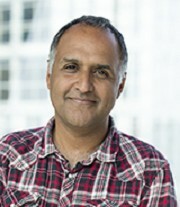 Shahid Khan is an Associate Professor in the Leiden Malaria Research Group, Leiden University Medical Center, Netherlands. Shahid graduated with a degree in Parasitology from the University of Glasgow, after which he worked as a Research Assistant in the Institute of Molecular Medicine, University of Oxford (in the group of Chris Newbold). For his PhD he moved to the University of Cambridge, where he performed molecular genetic studies on the protozoan parasite, Toxoplasma gondii. He worked as a post-doctoral scientist at the National Institute for Medical Research (London, UK) where he examined the expansion and expression of multi-gene families involved in malaria-parasite invasion of red blood cells. Currently, he is a group leader in Department of Parasitology, Leiden University Medical Center, The Netherlands. Together with Chris Janse he is engaged in studies to generate vaccines against malaria. Specifically, the focus is divided into 2 main activities. First, the group is looking to generate, assess and clinically validate live genetically attenuated parasite vaccines. Second, the group is also developing novel vaccine testing platforms that can be used to rapidly down-select sub-unit vaccine candidates and to test different vaccination modalities. The group is also engaged in studies to improve genetic modification of both rodent and human malaria parasites. Techniques that are being both being used to create the next generation attenuated vaccines and also to create various modified transgenic (rodent and human) parasites that can be used as reporters lines to test different anti-Plasmodium drugs and vaccines.